Action: Shape land x 5!! to extend the southern mountain range to the coast. It is still passable in the north-eastern side, but goes to the ocean in the south west. Points remaining: 1 + 3 = 4 to start next round. Vote continue first age another round. Shape Climate 1" X 7 - The north west mountain range redirects a major jet stream, casting much of the north west section of the land beyond the mountain range into perpetual winter. Action: Shape land x 3 - a little more desert. I think I'm almost done with it. Shape Climate 1" X 3 - Continuing to add to the snow field. 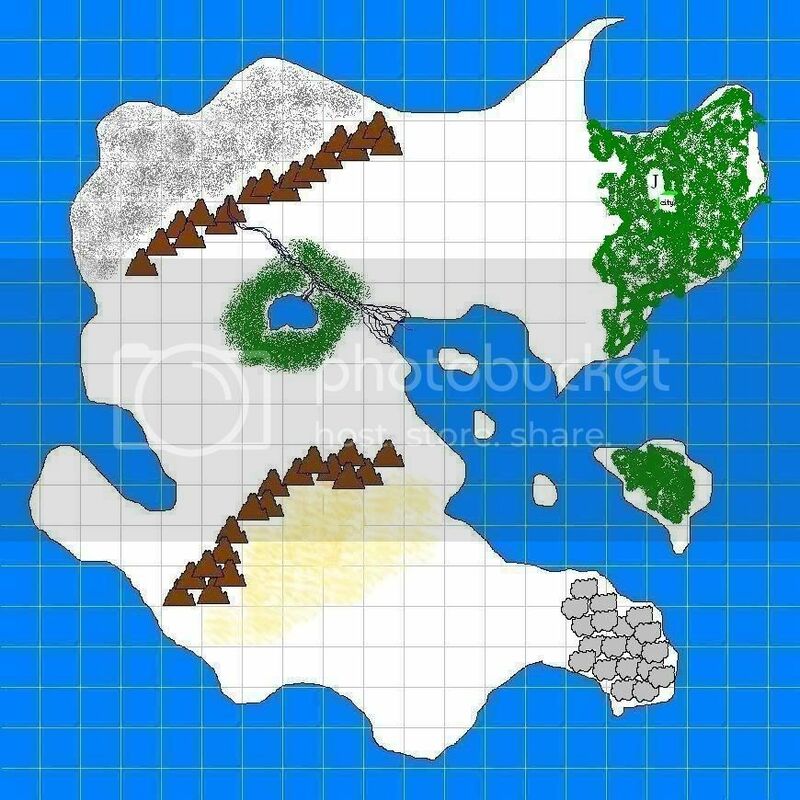 Command Avatar: Have Joramund Create City for the treefolk, this "city" is really just a wide open valley in the middle of the forest that they'll basically teraform into something approaching a higher degree of order than the rest of the forest. They give it no name, simply referring to it as "home", or, at most, "The Vale". I think I will also vote in continuing the first age for one more round. In retrospect, it seems like this map was large for three people, but there wasn't really a way to know that . . . Shape Climate 1" X 4 - Finish the snow field. Command Avatar x 1 -> Command City to produce a wonder. We'll say that the centerpiece of the city is a luminous pool of water, bathing in it promotes long life and heals terrible wounds. It's presence in the city is felt throughout the vale as the increased fecundity turns it into a garden of surpassing beauty. Action: Shape land x 3 - smoothed out the edge of the desert. I took two full boxes and about a box worth of spill over there, if anyone thinks it is too much space, let me know. Shape Climate 1" X 6 - A strong southerly wind breezes across the tropical island, pushing most of the mist generated by the rain there across the ocean. This covers the southern peninsula in a thick fog year round. Command Avatar -> Create Order -> A high distinction within Treefolk society of people dedicated to the nurturing of all living things. Such members are called "Elder [First Name]". I was thinking about what Tozzi said on the chat about wanting to put a river in his desert, and I'm thinking that he should be able to do that for free. He already paid the cost of changing the terrain, and there's no rules about change the terrain in one square to two different properties at the same time, so I think when he changed the tiles to desert, he could have also added the river through it at the same time. As this is our first time out, I'm ok with him going back and retconing the river into existence in the desert. Of course, he would have to pay to extend the river out of his desert to a tile he didn't pay to transform, but how does that sound to you guys? Action: shape land x 4 - to the southeast of the desert there is a great cliff, soaring thousands of feet into the air. The desert rests on the plateau on the north/west side, and the lower lands to the south and east. A river coming down from the mountains courses through the desert and cascades over the cliff in a great fall. Create Avatar - Clawing her way through the fissures and splits in the land, a great white dragon emerges at the top of the north west mountains near the start of the river and calls this place her new home. Command Avatar - Loving her new home, but feeling loneliness at being the only of her kind on the surface, the dragon goes about creating brood of children. These children are the start of the Dragonborn race. The Dragonborn live with the white dragon for many centuries, simply calling her The Great Mother. Note: We're now at the point where if any one person wants to end an age, they can do it. It's not majority rules anymore. I'm thinking of ending the age at the end of this next round.